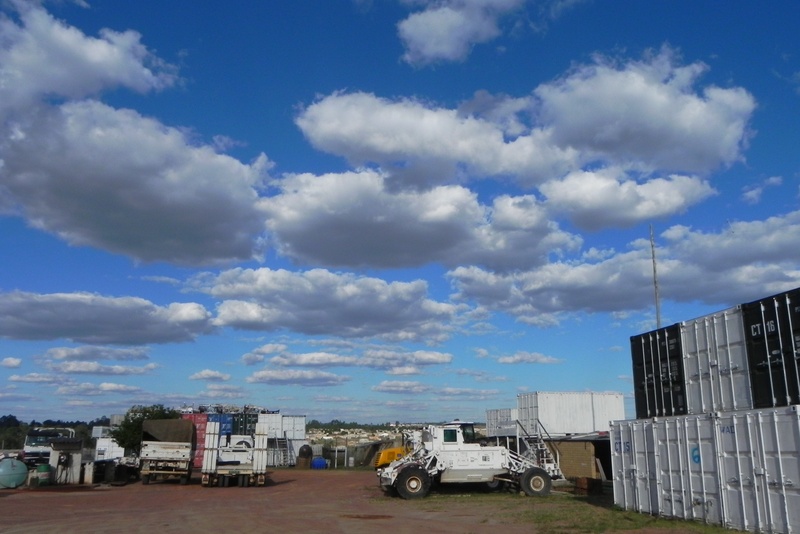 This is it folks….the end of the road, the final curtain…after 3 years of happily blogging about the trials and tribulations of my life in humanitarian mineclearance in Asia, Africa, Asia and back to Africa, I’m hanging up my blogging boots on the open world wide web. Time now for Misshelen to ‘go underground’! Just before I go…I’ve just been on holiday! Yes you did read that right, I’ve just taken a holiday – a short holiday but a holiday all the same. I needed to escape Angola for a wee while and amazingly in all my time living in Mozambique I never made it to Kruger Park so took the opportunity to nip over for a quick break and some wild animal spotting. An absolutely fantastic trip and highly recommended. Want to see my holiday snaps?? 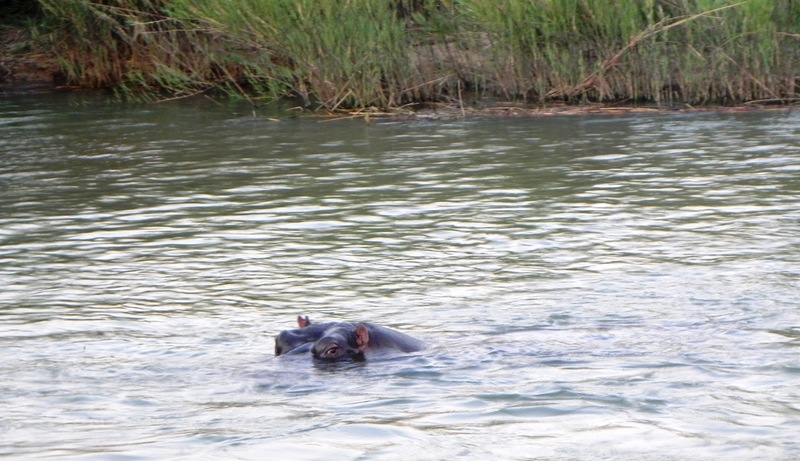 Hippos are the coolest animals in the park! They submerge themselves under the water with just their searching eyes poking above the surface. 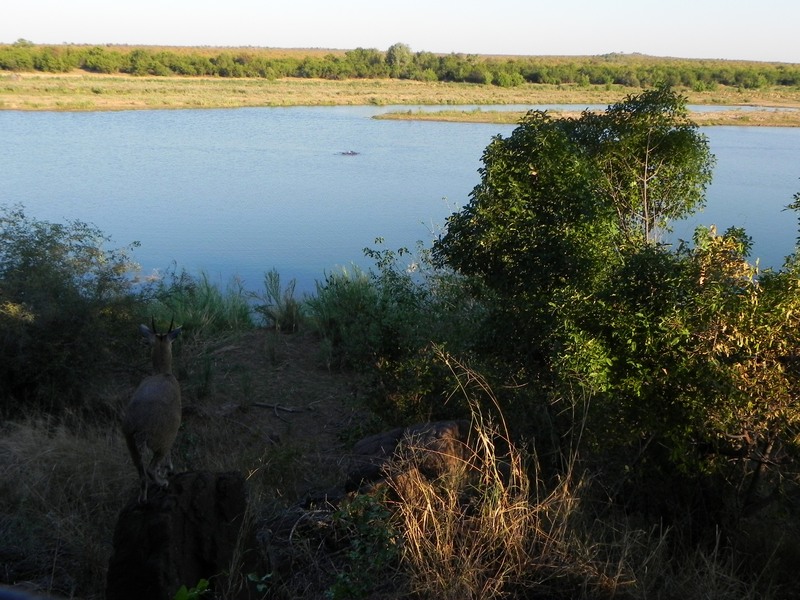 Just one of many beautiful waterholes in the park where you silently creep into a hide and watch the animals close up. In the bottom left of the picture is a ‘klipspringer’ (which means rock jumper in Afrikaans). We watched this beautiful African antelope with its ‘salt and pepper’ coat perch on a rock watching the hippos lazing in the water. 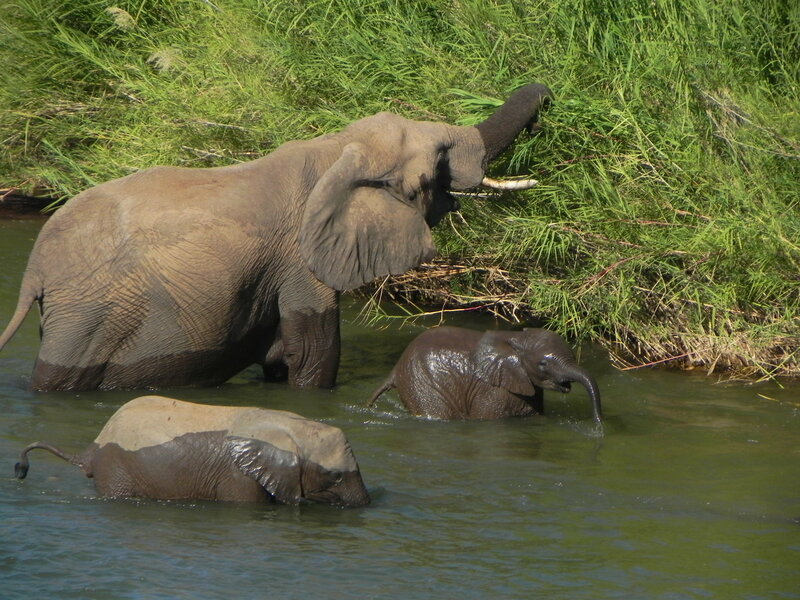 We watched this family of elephants wade across the river with the mum giving her babies a shower as they went. You can tell the big elephant is a female as the females spent their lives in a tight knit group of mums, daughters, sisters and aunties where as the male elephants tend to live on their own. Thank goodness for camera zoom lenses – although mine paled in comparison to some of the super duper cameras we spotted in the park. 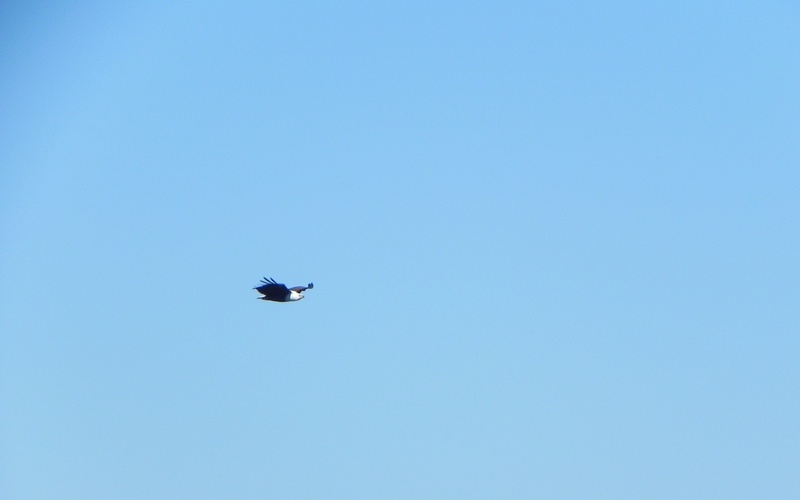 This is an African fish eagle flying high in the sky looking down into the vast expense of water for fish. Having spotted ‘lunch’ swimming in the water below, these eagles swoop down to catch their prey with their talons. Their distinctive cry is unmistakable and is said to be the sound of the spirit of Africa. It’s breakfast time for this giraffe. 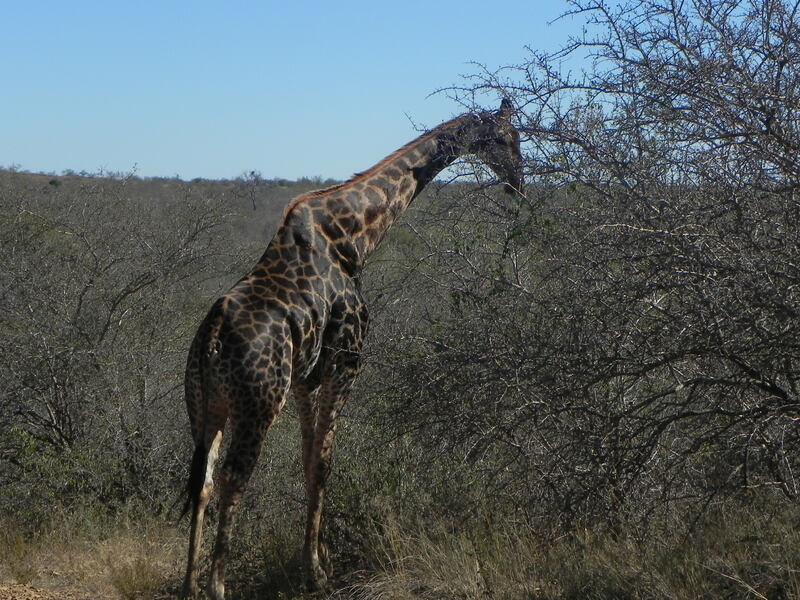 It’s hard to get the scale of these animals from a photo but this one we spotted must have been nearly 4m tall! 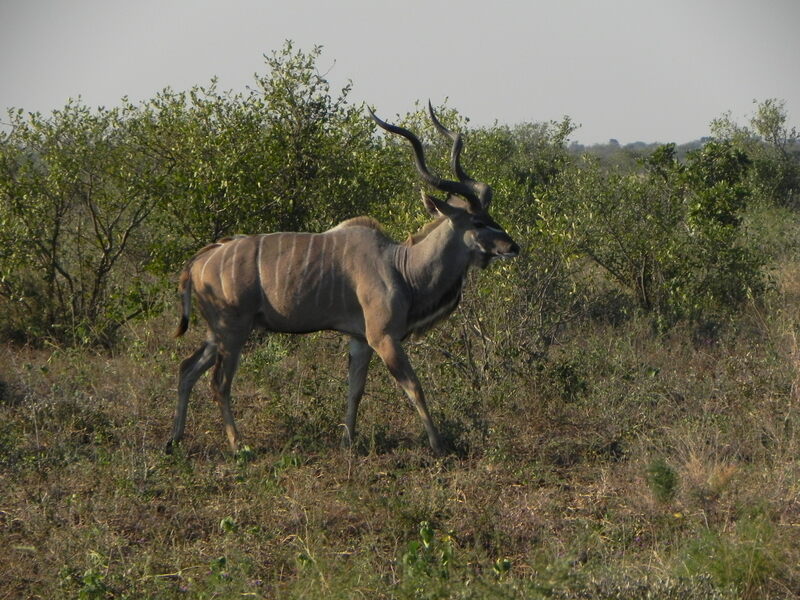 These kudu antelope – with their distinctive long spiral horns and white stripes – are probably the most spectacular antelope in the park. Their horns can actually be used as musical instruments! 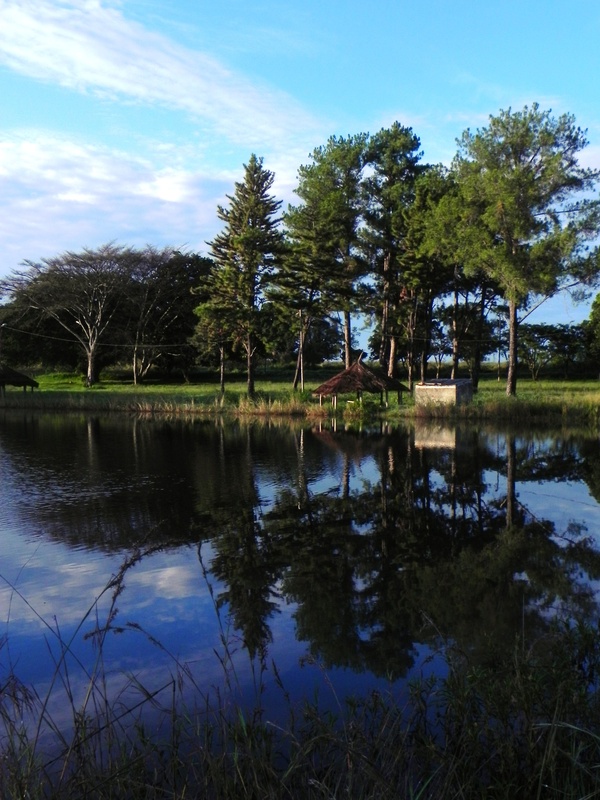 I do love a good tree – and Africa has them in abundance. 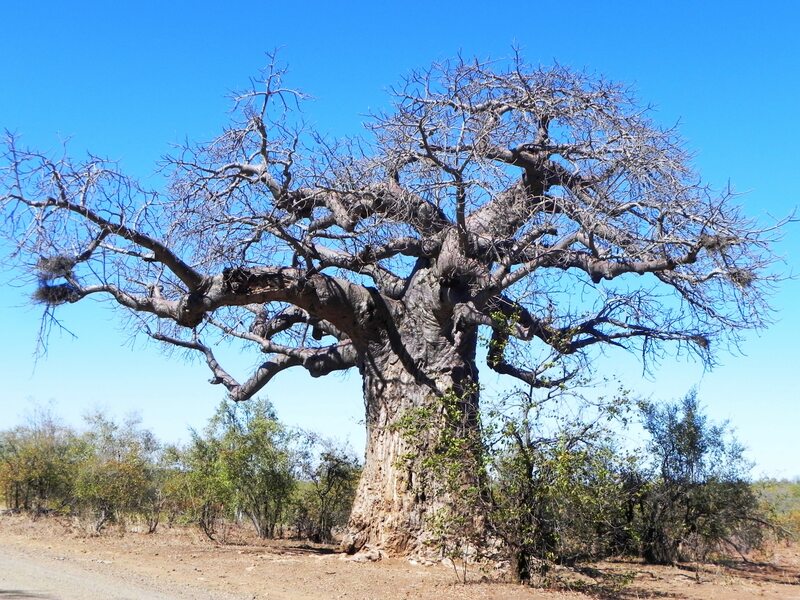 The baobab tree is probably my favourite…well maybe the baobab and the marula! These baobab trees are somethimes called the ‘tree of life’ or sometimes ‘the upside down tree’ because the roots of the tree are out of the ground on the branches and if you dig down into the ground under the tree you will find the leaves where the roots should be. ONLY JOKING! Thanks world for reading my blog and for all your comments. Posts now are for family and friends. When I was given directions the first time I visited this office, when they said ‘abandoned tank’ I didn’t realise they actually DID mean an armoured tank! I managed to make it out of my office yet again, to visit another of our provinces. Making it as far as the compound I then made the fatal error – instead of getting in my car and driving to the minefields – of switching on my computer to just ‘quickly’ check emails! I never did make it to the minefield in the end but even so ‘a change is as good as a rest’ apparently and actually working in an office which is not my usual office does seem to make me a little more productive. My original plan was to visit our road clearance teams. Actually I say ‘clearance’ but what we do a lot of here in Angola is ‘Road Threat Reduction’ which is not like mineclearance where we dig out every single metal signal from the ground but instead we drive down roads in a huge armoured truck dragging heavy trailers. 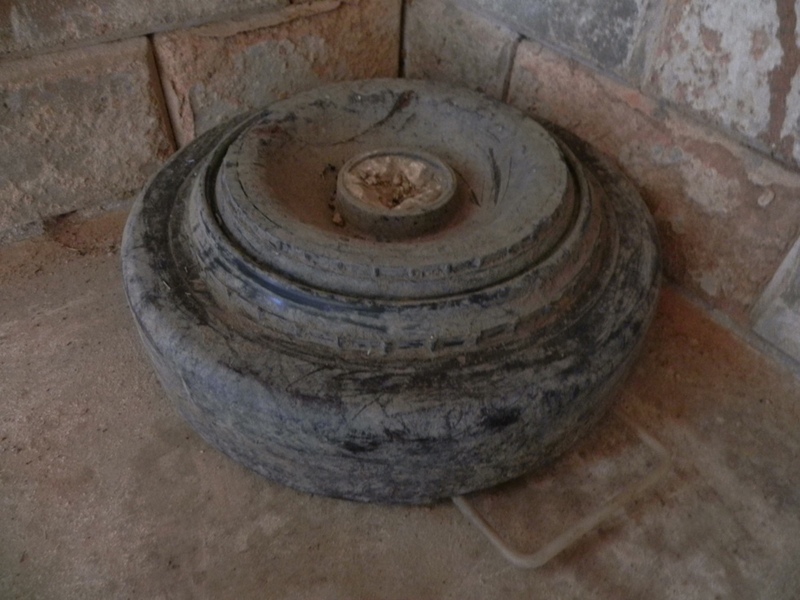 The concept is simple – a heavy weight on top of a landmine activates it so we drive over suspected roads with something very very heavy! The problem we have had recently is actually getting these trailers onto some of the roads. We are just coming out of the rainy season during which bridges have collapsed and roads washed away meaning we simply can’t access where we need to get to. So we have a back up plan…it involves a man and a wheelbarrow. I know I know…hugely technical! This concept is more like our standard mineclearance but adapted for roads where the danger is from anti tank mines (so you can walk over these mines but the weight of a vehicle would set them off). 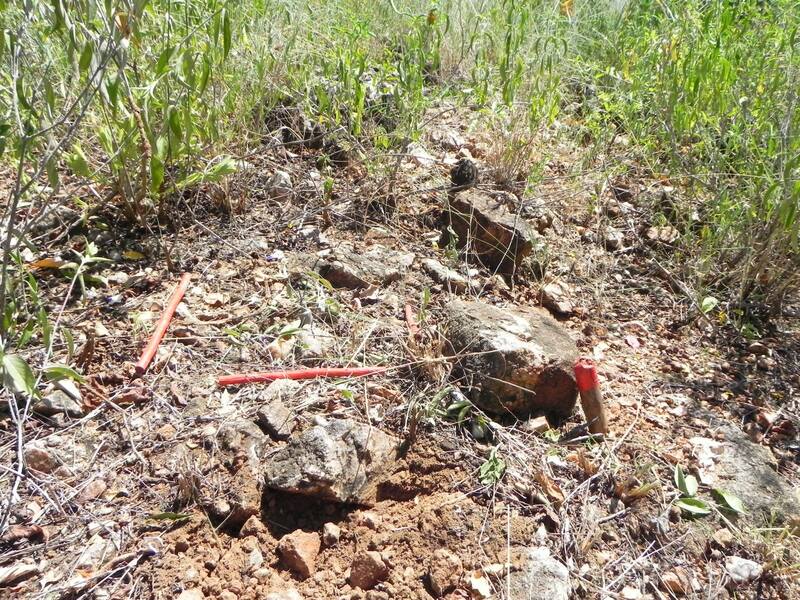 We send a man with a huge metal detector strapped to a wheelbarrow down the road and when the detector finds a metal signal in the ground a couple of deminers come and dig down to investigate whether it is a mine or not. All this goes on in Bie province which is way out east from my usual home town. Bie is where we started our clearance in Angola, back in 1994. We stayed throughout the war and such is the enormity of the landmines problem that we are still clearing the province to this day. Chatting with my staff here is fascinating. 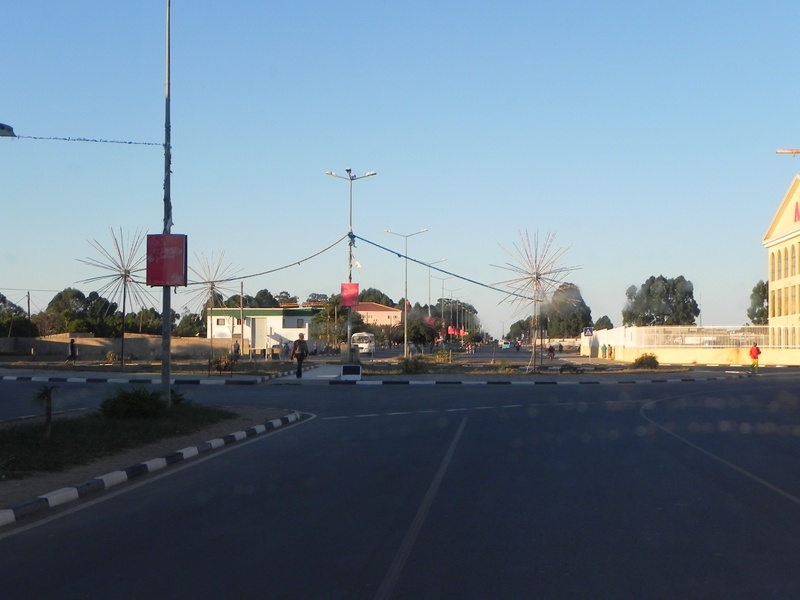 Most of them worked with us during the war and they describe the provincial capital being divided down the middle of the town with Government troops on one side of the street and the guerilla forces on the other. You can almost imagine a thick painted line down the centre of the road. Our first emergency tasks when we arrived in ’94 were to create safe land for refugee camps to be built on. Visiting these sites now they are unrecognisable from the old photos adorning our office walls. Now they are markets, schools and hospitals! With work still to be done it would be incredible to revisit in another 5 or 10 years time and see just how different again this town is. Maybe happy memories being relived? 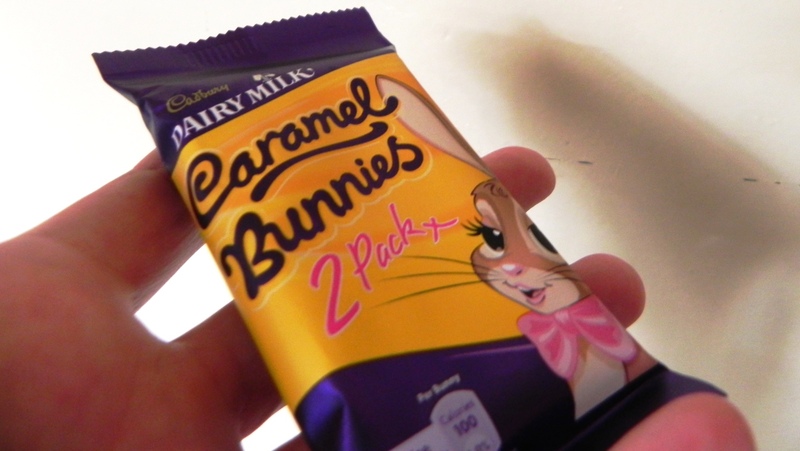 Either way I feel like I’m back on a family camping holiday this weekend. Deciding I was spending too much time in the office I headed out for a few days to one of our remote camps. 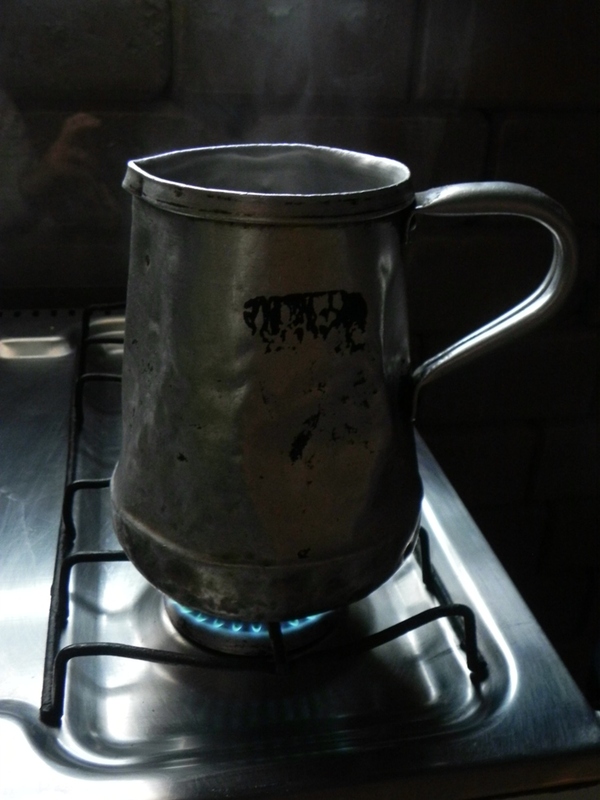 Arriving at the camp I felt like I had turned into Mum..unpacking the coolbox into a little travel fridge, taking your boots off at the door to keep the mud out, heading off into the dead of the night clutching your torch and your loo roll, boiling up some water for a cuppa ‘old style’…. The smell of a burnt match and a gas cooker always takes me back to our retro family caravan and Mum making a cuppa as soon as the caravan was parked up. The only thing which I’m sure didn’t happen on our camping holidays…or maybe I just blanked it out…was the COLD COLD shower. I say shower when I actually mean a big bucket of freezing water and a plastic jug! Gasping as the water splashed onto my head, it was so cold it literally took my breath and actually gave me an ice-cream headache! I’m still chilly now, an hour later, sitting in bed, wearing all the clothes I could lay my hands on. It was good to be back in the field today though. We visited one minefield which we are close to finishing clearance of. As I was briefed by our supervisor he told me that just last week a woman from the nearby village had turned up at our briefing shelter carrying an anti tank mine. Literally walking towards our supervisor holding this huge mine in her hands. She was urged to put it on the ground very slowly and very carefully, which she did. The supervisor edged closer and saw that the mine had a huge chunk out the top of it – this woman was one lucky lady. She had been cultivating her land and hit the top of this mine with her hoe, the chunk out the top was where she had stuck the mine. I dread to think what could have happened if she had struck it a few inches to the right. 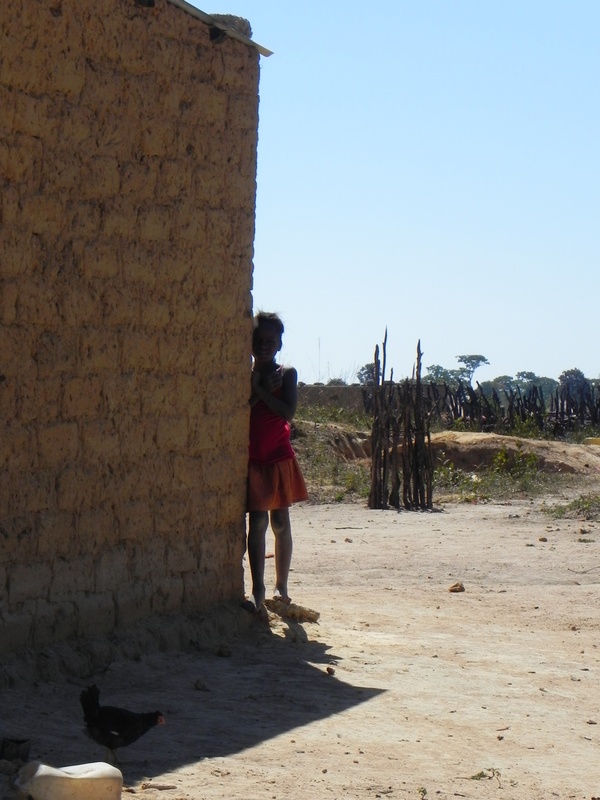 My supervisor led me to where this woman had found the mine – I found myself walking straight into a village. Incredibly this lady had literally dug up an anti tank mine in her back garden. Within minutes of standing at the site we were surrounded by inquisitive children. If this woman had activated this landmine all these kids would have been within striking distance. We spoke to the local leader of the village who explained to us that this community used to live a few miles away but the soil was not good for cultivating so they had moved their entire village to this new site – unbeknownst to them rebuilding their houses on a minefield. Marking off the dangerous area we moved some of our deminers to start clearance and are now clearing inside and outside these houses. Three more mines have already been found! Days like this certainly make my job feel oh so very real. The community are amazingly still building new houses on this land – on the ground you can see red stones which mark the edge of the suspected area. This week we had an unexpected visit from a lovely team of film makers. Actually here to film the underground world of Angolan metal and rock music (!) 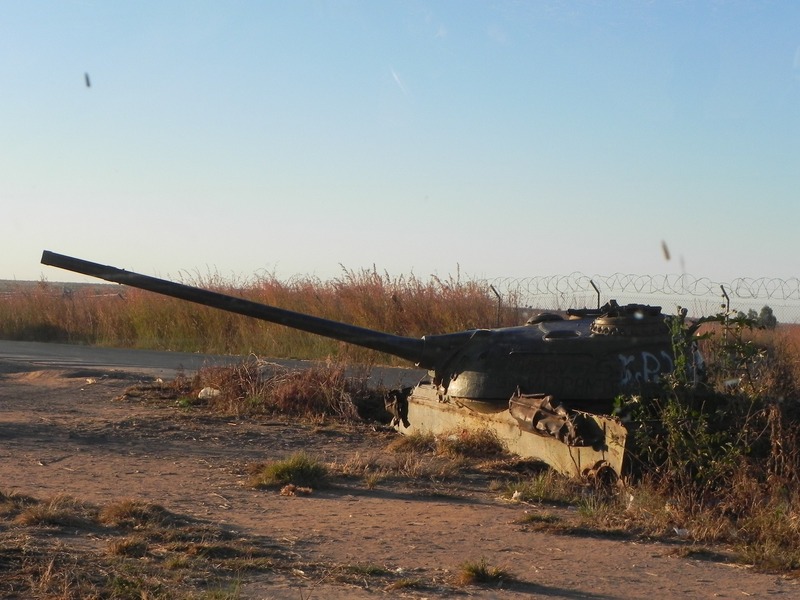 they were keen to find out more about the landmines problem in Angola. 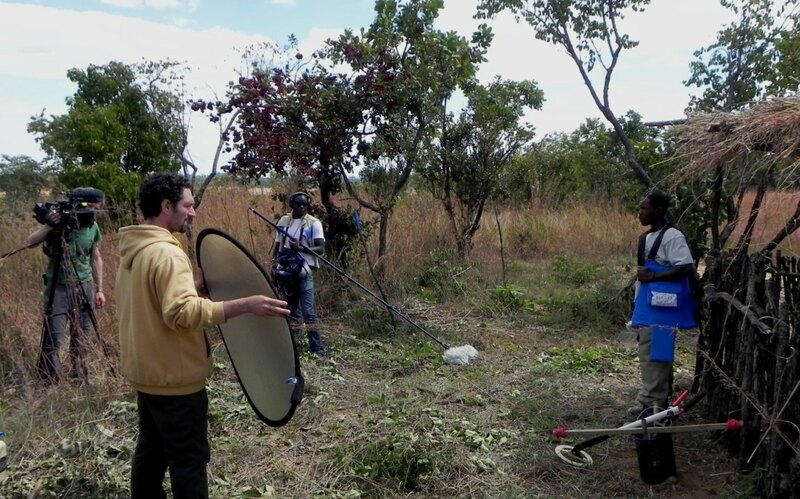 Always happy to bang the drum and raise the profile of the threat of landmines here, we set up a day filming in one of our minefields. When they announced their arrival dates my initial thoughts were that their timing couldn’t have been worse. 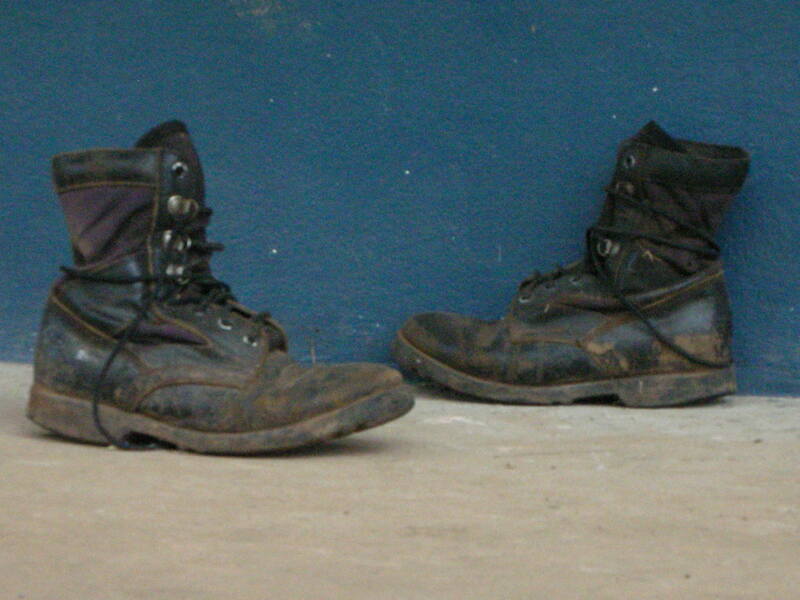 Each month my deminers work for 3 weeks then take a week break, 3 weeks on, 1 week off. Typically our new movie maker friends were due to arrive the week we weren’t working. So what do they film? 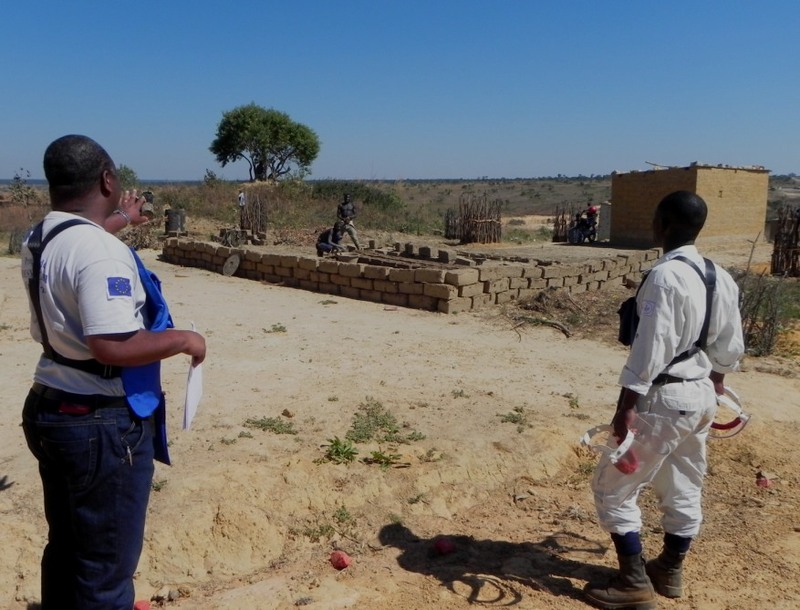 Not to be defeated by this mere ‘logistical challenge’ we plucked a few of our hardy deminers and their supervisors out of their monthly tools cleaning session and set up an exact replica minefield (sans landmines!) in our training ground. To be perfectly honest I think both myself and the film crew actually preferred it in the end. I didn’t have to spend the entire day worrying about them crossing our marking sticks into dangerous ground all in the name of a good shot and they didn’t have to try to get the perfect shot whilst sweating in our heavy body armour! 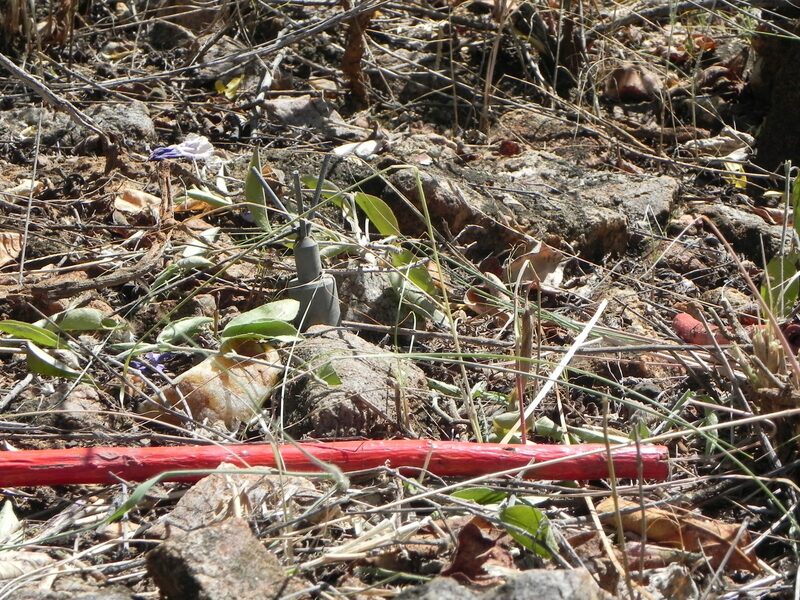 It was facinating watching the cameraman work…we always struggle to demining look, well, interesting! I mean its really just a man on his knees with some gardening tools digging holes in the ground, admittedly rather dangerous ground. Photos never do demining justice; the look of concentration in our deminers faces as they work away or the sheer length of time it takes to clear just 1 metre forward. Neither do you get the sounds of the minefield – the click click click of the detector battery, the gently spoken words of advice from the supervisors, the squeak of the detector when it identifies a metal signal. The film crew will hopefully capture all which makes our working enviornment surely one of the most unique in the world. 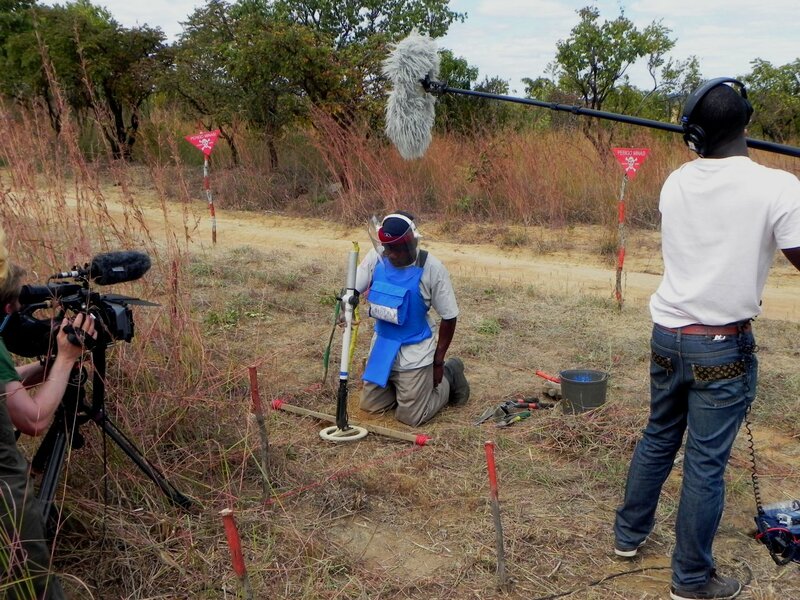 The deminers worked so hard, bless them, and by the end of the day they were positively relishing the attention – I swear they were actually ‘performing’ for the cameras by the time we filmed the last few shots of the day! It also got me out of the office and reminded me that two days really never are the same out here! It was a long hot day but the producer seemed happy. I’m hoping we’ll get a look at the finished film before too long. I can’t wait to show my deminers them in their starring roles.
. Eat your heart out Hollywood! I have 2 dogs out here – not taken on me but inherited from another expat who was here years ago. These poor dogs must get serious cabin fever as although I live in a fairly big old rambling house, the compound it’s in is not so big. So as often as time allows I take the dogs for a long run just out of town. 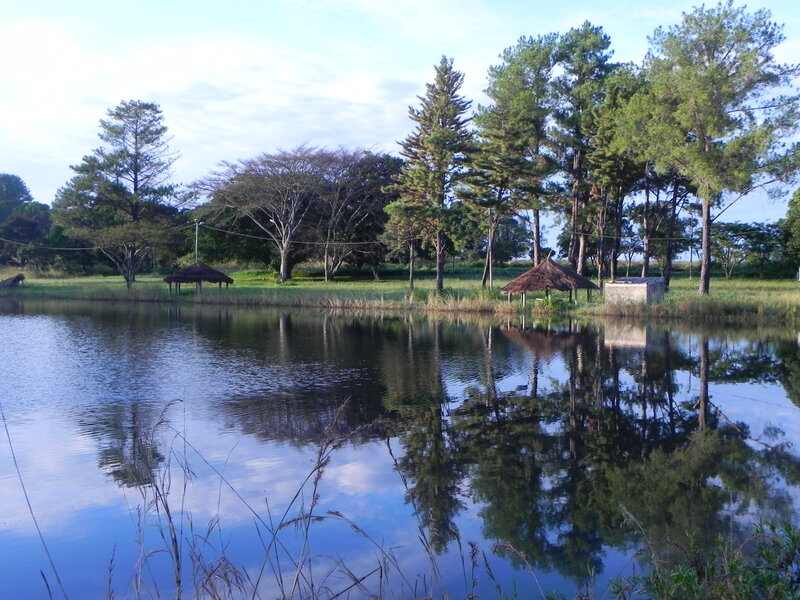 The place is actually the land of an agricultural training college and gets busy on sunny weekends with picnicking Angolan families and young couples. 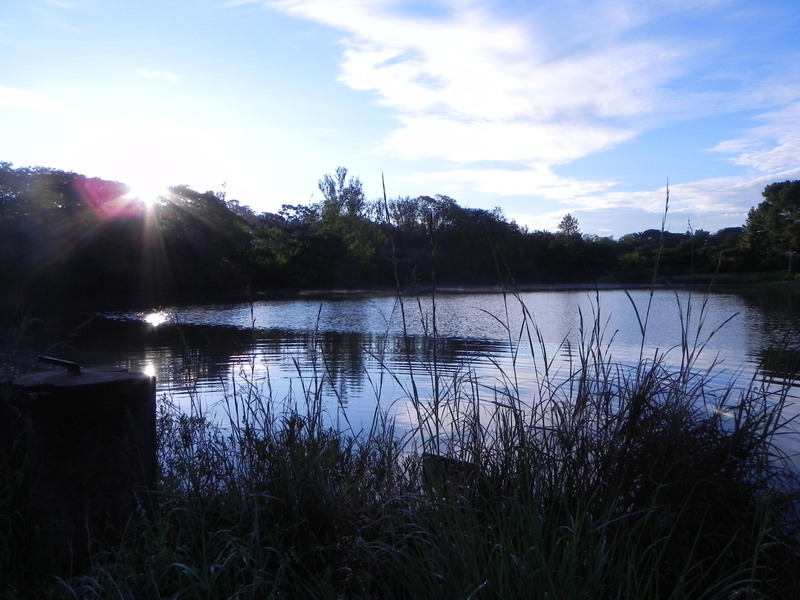 I am an early bird these days so tend to arrive way before the crowds which means the dogs can be let off the leash to race round like lunatics and go a swim in the lake. Last weekend I was there particularly early, it was not too long after dawn. 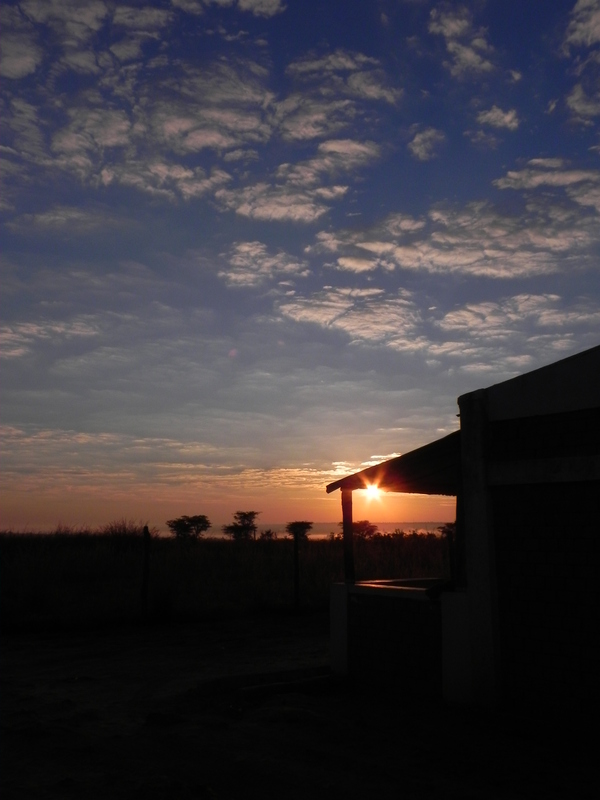 I stayed for ages watching as the sun came up and the light changed by the minute.
. 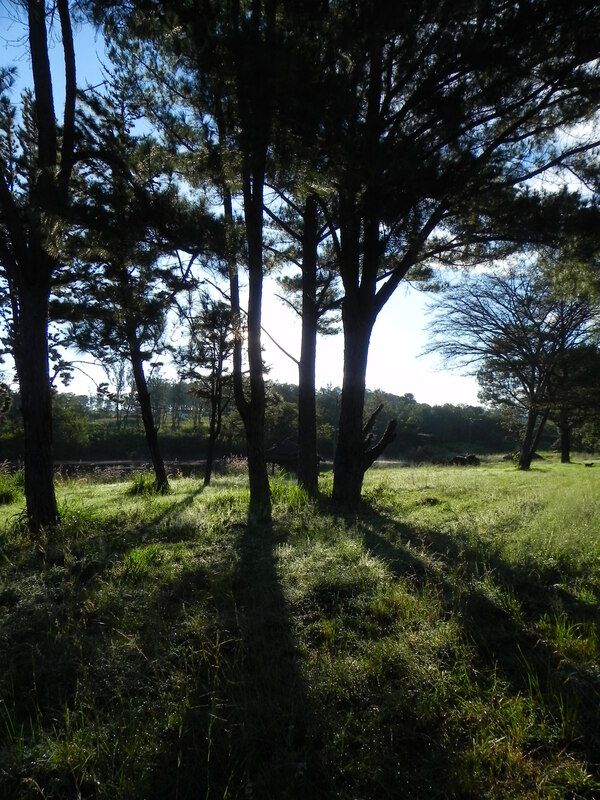 These are pine trees…in Angola, in Africa! It’s a really beautiful peaceful place in fact as I wandered round the muddy paths snapping away I felt quite homesick – it looked exactly like the English countryside and reminded me of home! Even so, occasionally what we are saying, no matter how clear we try to be, something’s get ‘lost in translation’. She was speaking with a supervisor about the amount of work he was doing. She thought he had taken on more than he could cope with and so told him he had ‘bitten off more than he could chew’. He said ok but looked quite dejected. She returned a week later around lunchtime and found him not eating. Now in Cambodia when food is up for grabs, it generally disappears fairly quickly but no matter how much she offered he continue to refuse the food. When she eventually managed to extract the reason why, she established that the week before her translator had translated ‘bitten off more than you chew’ to be “she thinks you eat too much” and so ever since the poor bloke had been starving himself!
. You have to wonder how red painted sticks can cause SUCH confusion! 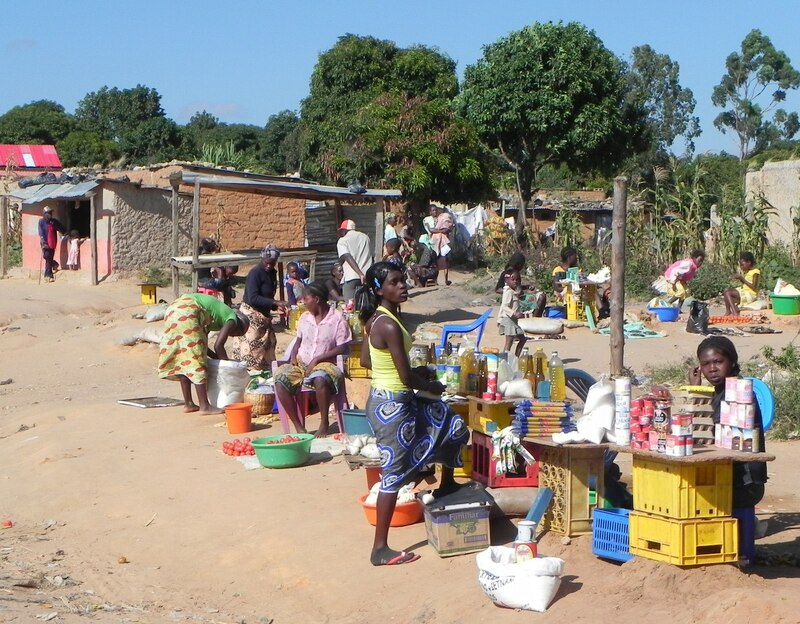 In Mozambique my colleague was on a money saving campaign and was trying to find ways to cut costs. 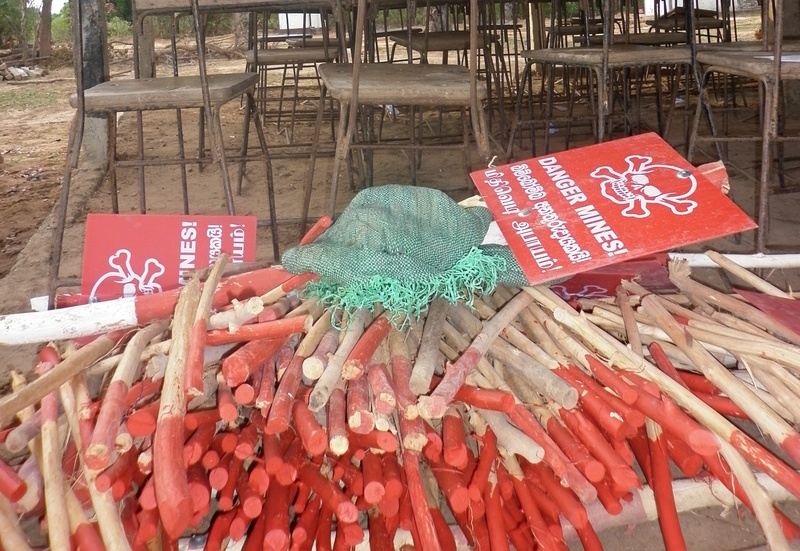 We mark our minefields with red painted sticks and he recognised that a lot of paint was being used painting the entire stick when really painting the top would suffice. Through his translator, he instructed his supervisors to just paint the top half of the stick from now on….or so he thought! 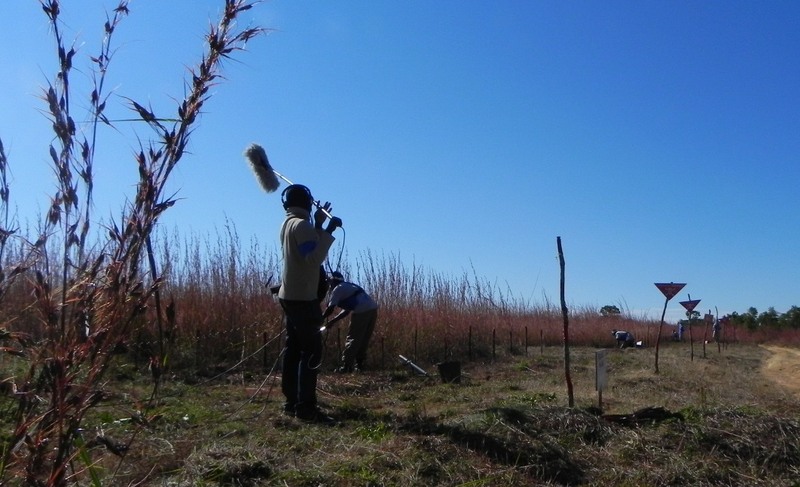 He returned to the minefields the following week to see several deminers NOT demining and instead they were methodically scrapping all the paint off the bottom half of marking sticks. When he asked why the supervisor replied that the previous week he had given the strict instruction that from now on “all minefields are only allowed to have half painted sticks”! Occasionally if we are clearing minefields on a site which had been the scene of heavy fighting during the war we find bones of a soldier who succumbed to his death on the battlefield. A colleague had been on such a minefield one day and given that these bones have been there for such a long time and any family long since gone, it is impossible to locate any relatives to remove the bones. So she instructed her supervisor to inform the local police before conducting a small ceremony and burying the bones. Returning a few weeks later she asked, through her translator, whether the supervisor had conducted the ceremony for the ‘skeleton’. The supervisor looked confused so she asked; did you tell the police about the ‘skeleton’? He again looked confused but said yes, he had spoken to the police about the site. She persisted and asked ‘well did you buy some rice and coca cola to give as an offering to the skeleton before it was buried?’ He looked even more confused so she went to the site of the bones, they were gone so she assumed her instruction had been followed. No wonder the poor supervisor looked thoroughly confused! I must remember to not use colloquial sayings when I speak through translators…I dread to think how ‘never judge a book by its cover’ and ‘if life deals you lemons make lemonade’ might end up being translated! What a weekend I’ve just had. Talk about random! Saturday was a typical working day, busy but we only work until lunchtime so not too bad normally. I have been so snowed under this week that I’ve not had time for any decent exercise so I was desperate to do something, anything on Saturday afternoon. It was looking likely and I was literally heading out the door with my trainers on and ipod in hand when my colleague approached me looking a little bit anxious and quite pale. She told me one of our guard dogs had just bitten a woman who was not sitting on the pavement outside our gate attracting an ever increasing mob of Angolans shouting all sorts about our savage mutt. We patched the woman up and took her to hospital for a check over but to cut a long story short I spent my Saturday afternoon in a crazy casualty department – and I tell you, you ain’t seen nothing until you’ve seen Angolan casualty on a Saturday afternoon! I stood there for hours looking slightly ridiculous in my running kit next to a crying woman who I’ve never met trying to reassure her in my best Portuguese whilst explain to some rather uninterested nurses what had happened – no mean feat when you don’t know the Portuguese words for ‘leg’ or ‘bitten’ so my explanation probably ended up sounding something like “lady walking, dog, here, bleeding, please look and help”. By the time I had taken her home it was dark so I gave up on my exercise and went to bed! 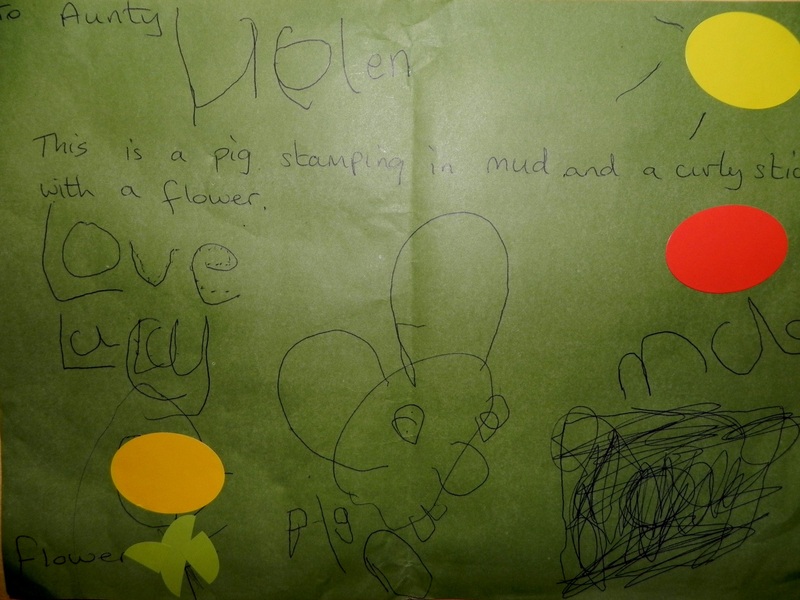 Looby’s picture of a pig stamping in mud and a curly stick with a flower…! It is unbelievable how little things like getting letters from home can mean such a big deal out here. 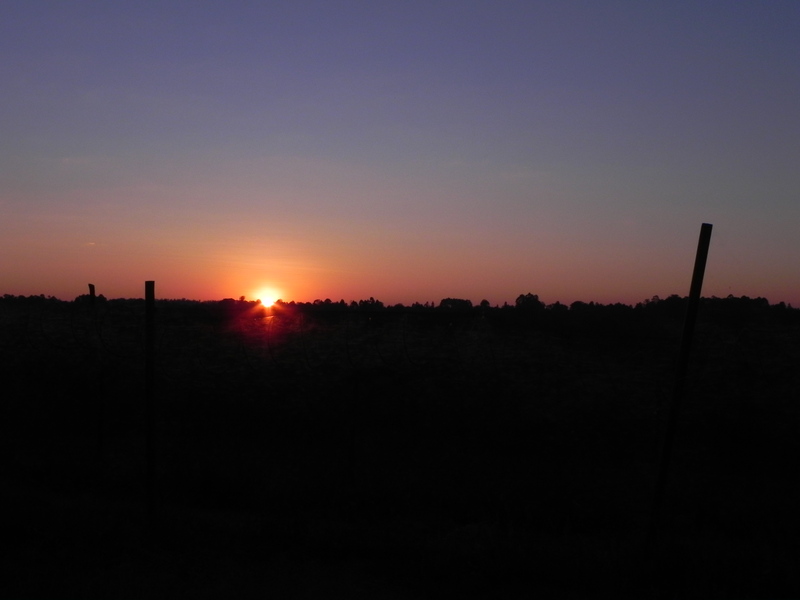 I felt really quite homesick by Sunday night – but thankful that Saturday had been an anomaly….what little did I know! Ah, so it would seem SUNDAY was the anomaly I thought to myself as the chaotic drama which is my life returned with a vengeance. At least there’s no time for Sunday night blues in this job! 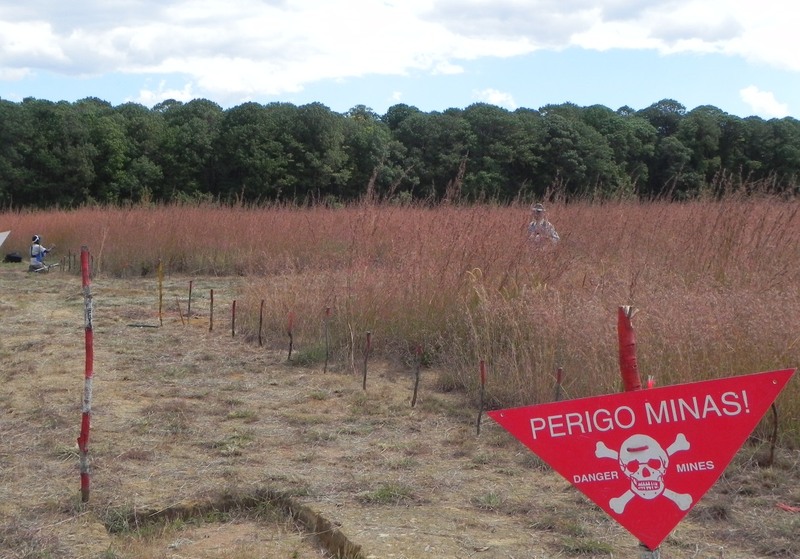 The most dangerous landmine in the world? 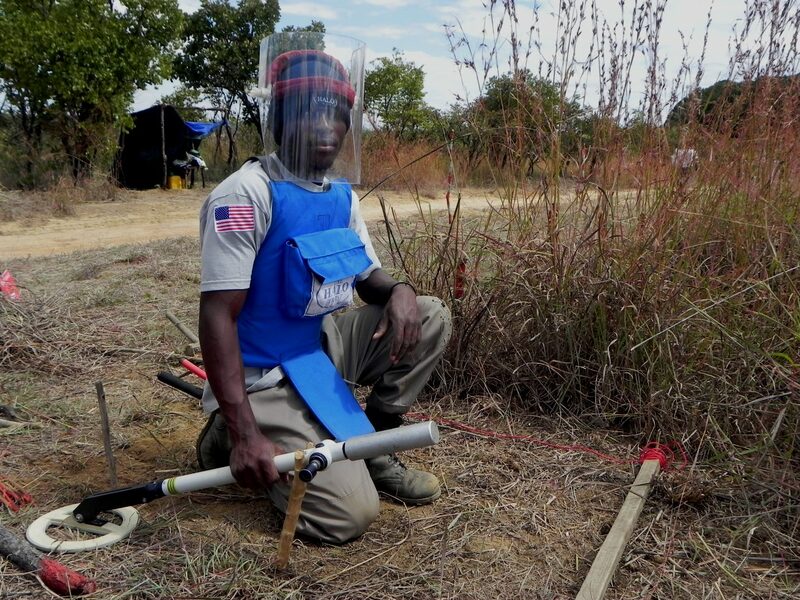 I have never taken the work of my deminers for granted. Having done the job myself – albeit briefly – their painstaking dangerous work is something to be held in the highest regard. 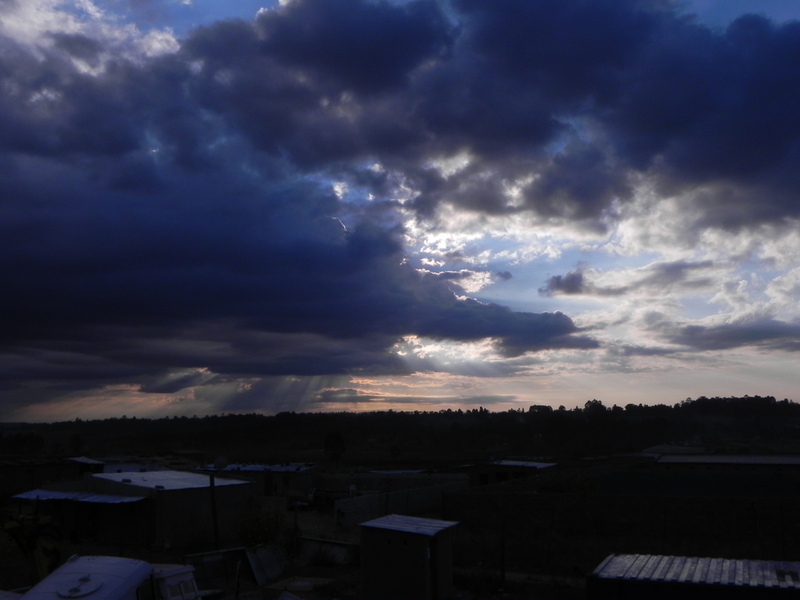 Now though, having arrived in Angola, my admiration has reached new levels. Close up PpMiSr hidden by leaves, you can just see the metal lid of the mine. With small pieces of metal sandwiched in between the inner and outer walls of the main body, when someone stands on the spike at the top of the mine it has a device which ejects it into the air and after a couple of seconds it explodes. As it explodes the metal pieces fly out. Can you spot the spikey top of the mine? 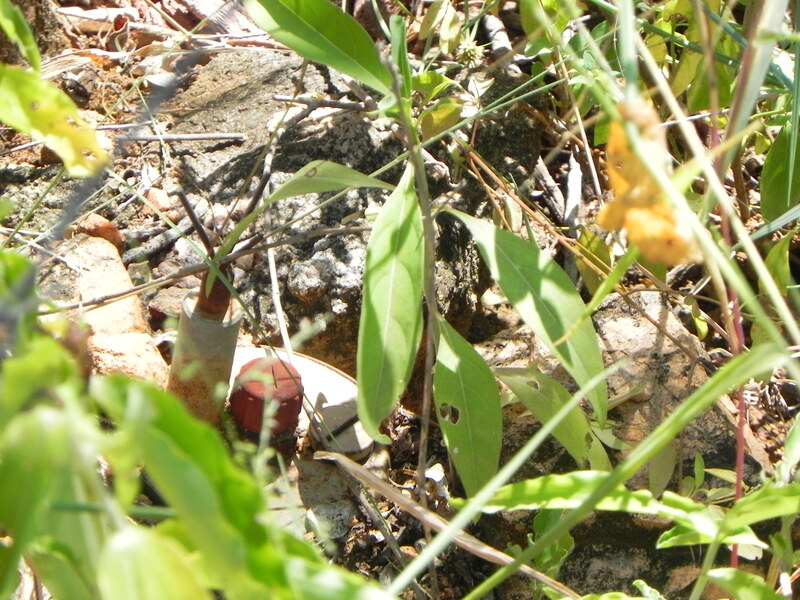 Being unable to spot them is what makes these landmines so dangerous to the local population who enter the area to cut wood or graze their cattle. Closer up it’s a little easier to spot but still fairly hidden in the vegetation waiting for an unsuspecting victim. In fact these mines are so dangerous that should one explode in the vicinity of someone it is essential that my guys wear specially designed PpMiSr protective body armour. 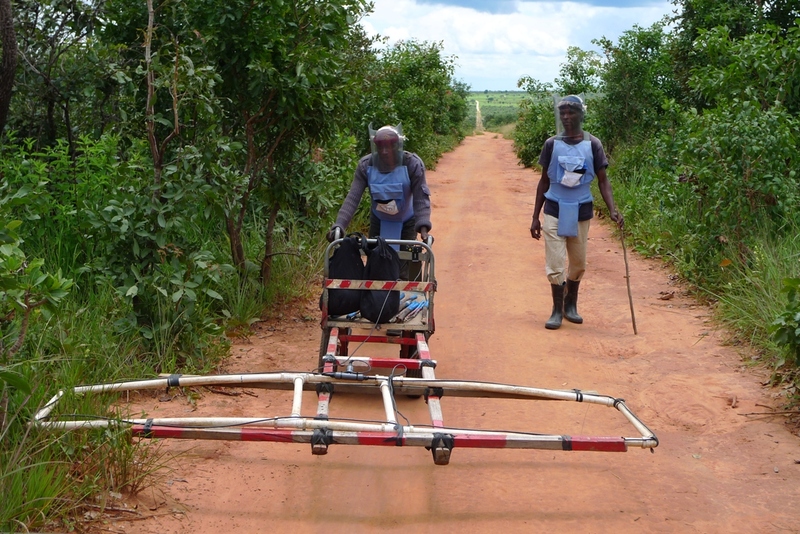 My hardy deminers hate it because it’s much more bulky and cumbersome than their usual protection, added to this these minefields are in one of the most baking hot and humid provinces. My guys are working on minefields right now where we are finding these mines.